Melt butter in saucepan over medium-low heat. Continue to cook, stirring frequently, until it starts to foam and bubble and then browns. When butter is fragrant and golden brown, take it off heat and let cool. Heat oven to 175°C/350°F. Grease cast iron pan with butter. Pit and slice peaches and toss with lemon juice. In a medium bowl, combine some of the flour, ground almonds, baking powder, and some of the salt. In a separate bowl, whisk together some of the brown butter and sugar. Add eggs one at a time, then vanilla extract. Stir in half of flour mixture, then crème fraîche. Add remaining flour and stir until just combined. 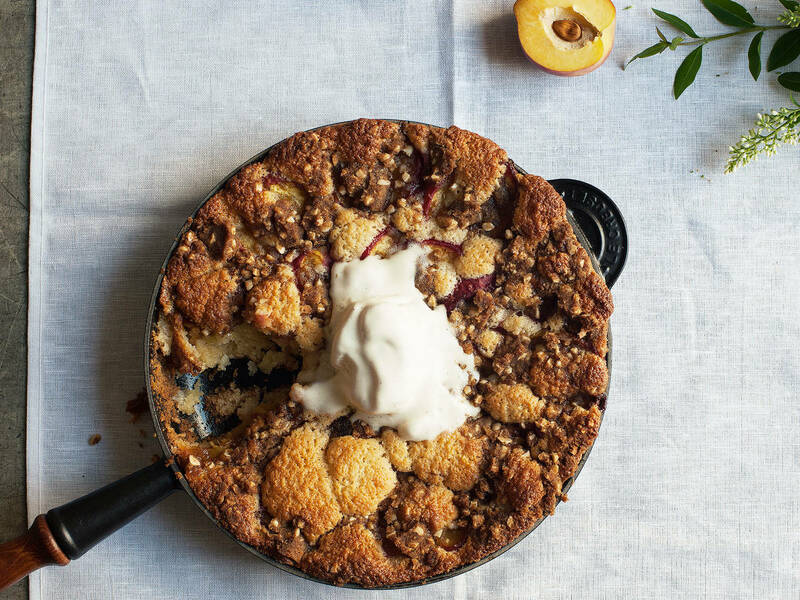 Transfer batter to the cast iron pan and top with a layer of peaches. To make topping, combine remaining brown butter, brown sugar, flour, almonds, allspice, and salt. Use hands to mix until large clumps form. Sprinkle over peaches. Bake for approx. 40 minutes at 175°C/350°F, or until golden brown and a toothpick inserted into center comes out with a few moist crumbs. Let cool for 15 minutes before serving. Enjoy!